In 2013, Massachusetts developed the One Care Implementation Council so consumers could have an active role in the implementation of Massachusetts’ Financial Alignment Initiative, known as “One Care.” I recently had the pleasure of sitting down with consumers, advocates and state employees to talk about their experience on the One Care Implementation Council, and these interviews did not disappoint. You can find the full report on the Council’s engagement process and lessons learned in a case study jointly produced by the Center for Consumer Engagement in Health Innovation and the LeadingAge LTSS Center @UMass Boston. As I reflect on the interview experience, I realize how much one can learn just by listening. 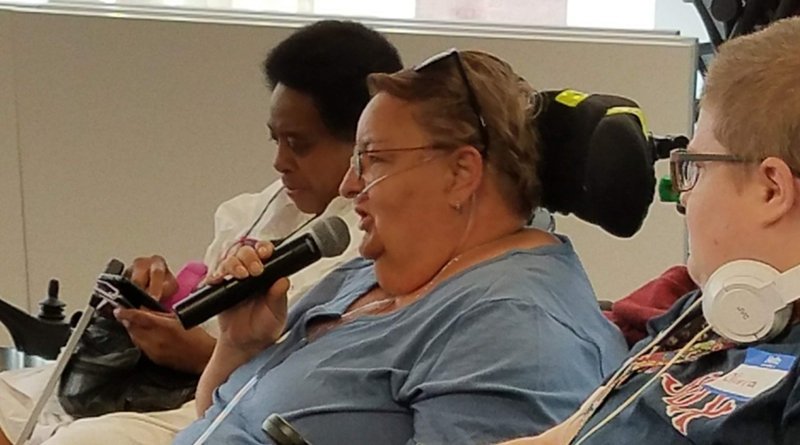 Without question, Massachusetts’ disability advocates have pushed aggressively for meaningful engagement in long-term services and supports (LTSS) program design for years, and this really influenced how advocates and state leaders approached One Care’s engagement strategy. This was not the advocates’ “first rodeo,” and so, they came ready with ideas for making the Council an active body. This meant ditching the term, “advisory” and replacing it with “implementation” to mirror advocates’ intention to be deeply involved and “part of the action.” State partners, who also have administered their fair share of engagement strategies, spelled out Council expectations, including its purpose and desired representation, through a formalized Request for Response process AFTER meeting with community leaders so that unnecessary process challenges were avoided. People often ask me, “How do I get stakeholders to show up?” In Massachusetts, both advocates and their state partners understood they were pioneers in the development of a new model for Medicare and Medicaid recipients, and as a result, it was crucial that they get it right. Implementation of One Care was high stakes and high profile, and that was the catalyst that drove stakeholders to this table. Advocates were especially concerned that One Care members’ lives would be at risk if this new model meant less services and the loss of trusted caregivers. Because of this, they used their Council role to advocate for proactive member education and smooth member transitions across providers and service settings. Given the model’s newness, state partners also grasped the critical role Council members would assume as ‘bridgers’ to the communities served, supporting the building of trust, thoughtful problem solving, and higher enrollment rates. The One Care Council also was formed with a thoughtful eye towards representation. The Council was intentionally inclusive, including not only MassHealth members with disabilities, but also their family members, community-based organizations, advocacy organizations, unions and providers. While the goal for broad-based representation was in itself lofty, the Council and state partners thought that as a practical matter it was essential for reaching some of the most isolated communities within the Commonwealth. Even so, being inclusive came with its fair share of challenges, including member turnover. Acquiring and retaining Council members from far-reaching ends of the Commonwealth wasn’t easy, even when a teleconference option for meetings was provided. Also, supporting the accessibility needs of individuals with cognitive disabilities was difficult given the fast-paced meetings and the highly technical nature of the conversations. Council members found that being inclusive to individuals with diverse needs was more than they had planned for, which required self-reflection and a willingness to change. Last, but not least, is my reflection on the Council’s ‘impact.’ Many people want to understand the impact of stakeholder engagement. People will ask, “Was it worth it?” and, “Did it actually lead to anything?” Impact, when it comes to stakeholder engagement, is a complex concept with what appears to be more of a curvy line to outcomes. The effectiveness of stakeholder engagement is driven by the interrelationship not only of the people who participate (and lead the process), but also the approach they use and the environment in which they are working (McGaffigan, 2011). Also, often times, perceptions of usefulness are driven by what we value, as individuals. Our case study report points to many places in which the Council influenced One Care’s reach, operations, and sustainability – often in ways the Council hadn’t originally planned. For instance, the Council struggled to meet work plan milestones, choosing instead to respond to more time sensitive topics, such as addressing members’ transition after the departure of a health plan and helping to secure financial sustainability for the program. Also, the Council’s biggest ‘wins’ occurred when it was working side-by-side with state partners to develop shared solutions, and not when it worked solely on its own. This underscores the point that the Council’s achievements did not occur in a vacuum. Through my interviews with One Care Implementation Council stakeholders, I was able to see first-hand important characteristics of a thoughtful advisory process for a complex model providing integrated health and LTSS for adults with disabilities. We learned about the Council’s formation process, communication strategies, accessibility practices and more. We have no doubt there are helpful recommendations in the report to inform similar Councils across the nation, whether they be new or well-established. I am thankful for what One Care Council members and their state partners have taught me, and what we can now share with others as a result. To learn more about One Care, the One Care Implementation Council, and the One Care Implementation Council Case Study, please visit the Center for Consumer Engagement in Health Innovation’s website.